In the last sections we went through the basic preparations, mainly involving not getting ripped-off and looking after herb plants. Now we will look at growing food in pots, as a practice run for bigger projects. This may seem like a bit of a childish activity, but if you’ve never grown food before this is a good way to start, as it is both instructive and rewarding. Cress is one of the easiest and cheapest things to grow, and you’ll be enjoying what you grow within ten days. Buy a small packet of cress seeds, sprinkle some of them onto a wet paper towel in a small tray or shallow container. Cover loosely with paper or card, or place in a dark place for the first day or two. After just 24 hours you’ll see the seeds already begin to germinate, after two days, once you can tell apart root and stem uncover or move them to a well-lit spot, making sure to keep the paper towel moist. After a week or two they will be fully grown and ready to pick to add to salads, soups or sandwiches. You can then keep growing more of it. 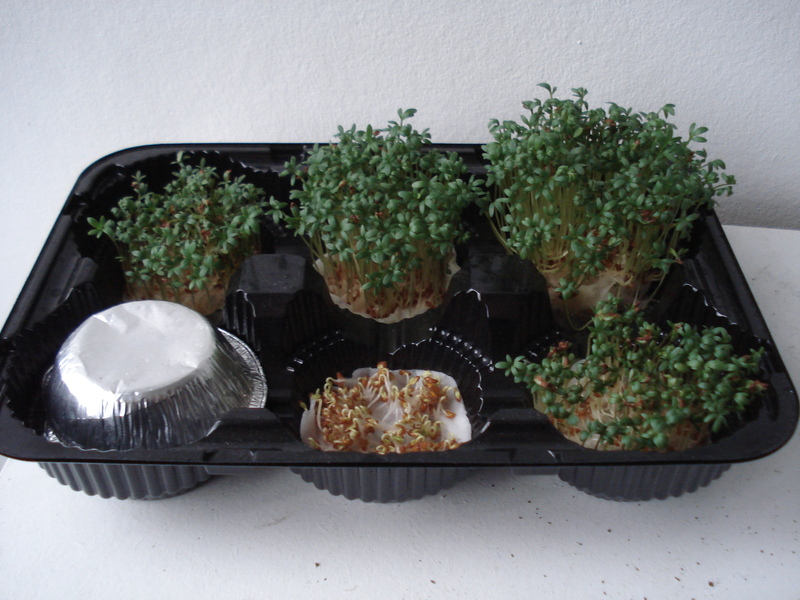 Have several small trays growing cress in a rotation so you can harvest some every two or three days. Try the same with mustard seeds. Maintaining several trays growing in rotation is like managing a tiny garden, so it’s good preparation for the real thing. Right, enough of the warm-up, let’s get planting. 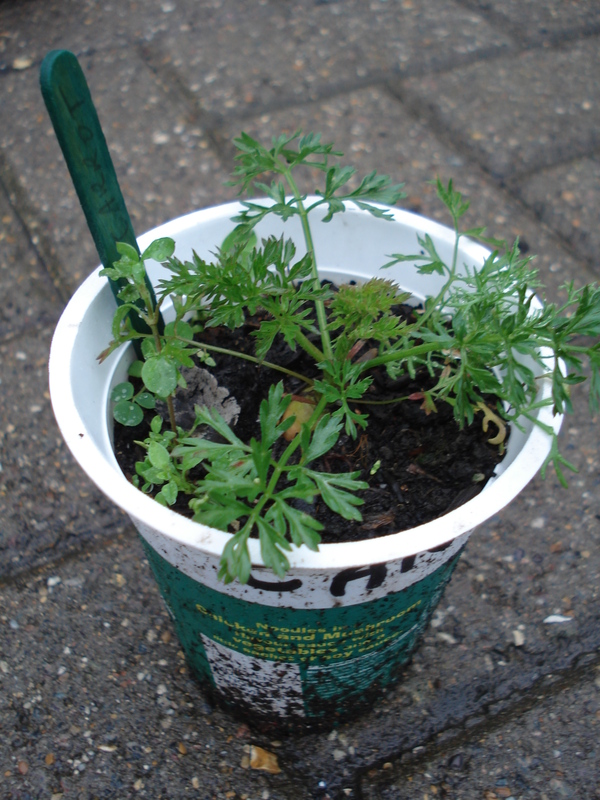 You’ll need a small bag of soil, suitable for growing food; a few pots for planting, either genuine or using recycled rubbish; and some seeds. What seeds to get? We want something cheap and cheerful, and all the better if you can get them straight from a vegetable. Edible things you can grow in pots include radishes, nasturtium, basil (and other herbs from seed), tomatoes, carrots, garlic, lettuce, chard and spinach, amongst others. Unless the seed packet says otherwise, just poke a shallow hole in the soil, pop a seed in and cover lightly. Remember to water it gently at first so as not to wash off the top layer of soil and the seed! 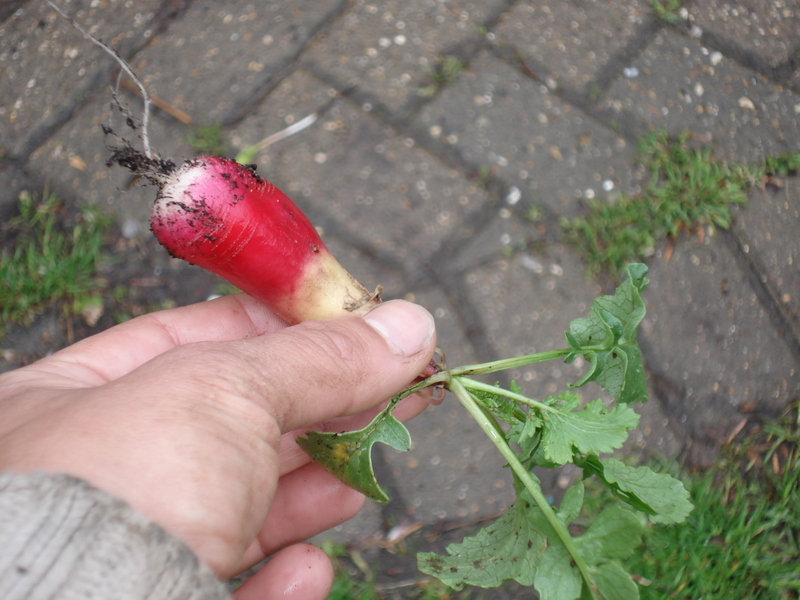 Radish seeds are cheap to buy, they grow reliably and fairly quickly and don’t require a large pot (a trusty Pot Noodle will do). The garlic and leafy plants can start off in something small and later be repotted into a bigger pot (or an old ice cream tub?) 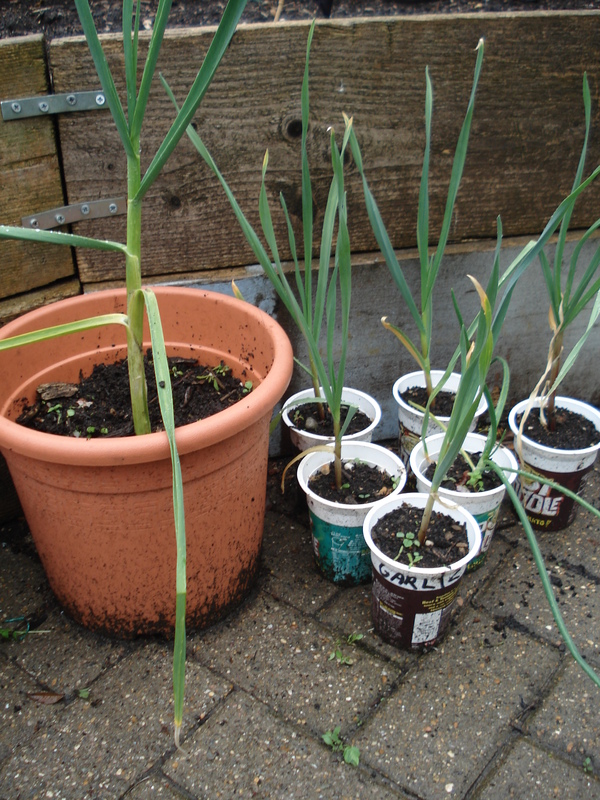 to give the roots more space; use old garlic cloves from your cupboard that have started sprouting. Tomatoes will probably require the most time and effort to grow, and are best repotted into a genuine pot to give it maximum space and support to develop. Furthermore, unless kept outdoors, you will probably need to pollinate the tomato flowers by hand, or have a few bees around for dinner (most modern tomato varieties can be pollinated using their own pollen, but they still need help with the actual pollination). As mentioned in the last post, START SMALL. If you get too enthusiastic from the very start and have ten pots growing at once you may find you don’t have the time, energy or space to look after them all. So just try one or two to start with and take it from there, letting it gradually become part of your routine. Over time lookup information on the plants and try growing other small vegetables in pots. You’re not trying to live off the land yet, so be bold and experimental. Make mistakes, watch them die, get over it, and start again. Learn from this, take your time and enjoy yourself. Admittedly, these babies are not going to see you through the winter, end world hunger or even win any prizes at your local flower and produce show. Does it matter? No. Why? Because at least you are doing, which is a lot more than some people can claim. Even if in one year of your busy life you only manage to grow one radish and a basil plant, it’s still better than just talking about it. The added advantage is that you can grow food in pots just about anywhere that receives adequate daylight, so you don’t even need a garden. If you have kids, you get to teach them something very valuable about food – a small lesson, but one that will hopefully stay with them. Unlike tending to a whole garden, it costs virtually nothing both in terms of time and money. 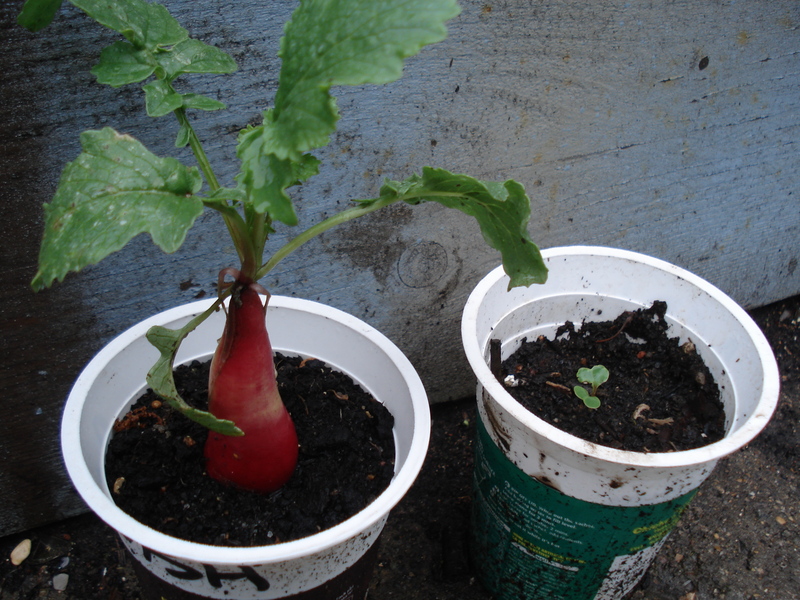 So give it a try, grow a radish, it will take pride of place on your dinner plate. In the next part we’ll finally start looking at the garden! A Common Ground member recently told me she attended a talk about setting up an organic garden (which is more than I’ve ever done), and admitted that after being fed endless information about perma-culture, soil acidity and all sorts of other yadda-yadda, she came out of it more put off than motivated. So top prize to those organic perma-clowns for running that particular talk – yet another monumental failure in education! I can’t be too critical of gardening experts, me being an ignorant amateur who accidentally ended up running an organic garden. But in my short time experimenting with growing food – with reasonable success – I have stuck with this simple rule: Growing food is about growing food, pure and simple. It’s not about crop rotation, it’s not about sustainability, it’s not about bla bla bla – these are all just additional extras. When you get a child to plant their first radish, chickpea or even cress, you certainly don’t start telling them about soil acidity or the embryonic dormancy phase of seeds (unless you’re aiming to put them off gardening for life). Simply put, a good way to start learning to grow food is to JUST PLANT SOMETHING AND SEE WHAT HAPPENS. Still, here is a more specific guide for getting prepared. Apologies to anyone who thinks the next section is too simplistic, but I’ve seen people in London who barely know what a vegetable is, and so this guide is designed to give anyone a chance to have a go, no matter how little experience they have. Step One: DECIDE YOU WANT TO DO THIS. This may seem an odd one to start with, but what I mean is ask yourself: Why do you want to grow food? Is it to learn a new skill? To save money? To save the planet? To impress a girl or guy? Or is it just for fun? Those are all good reasons – except the second one. If you want to grow food to save money, then think again. As I mentioned in a recent post, when you tally in the cost and effort, growing food at home rarely comes out cheaper than market prices. If you want to save money, you can probably find a dozen other luxuries you can cut down on (booze, ciggies, magazines, petrol, crappy electronic gadgets with a fruit logo on the back, etc.). Next, ask yourself: Do you really have the time and dedication to try this, or is it a passing whim that will die down after a week? A good test is to wait a week and see if you still want to do it. I’m not trying to be flippant, I’m just trying to save you time, money and effort. Some people get very excited about the idea of planting something and later eating it, but they are not so keen on the long bit in between which inconveniently constitutes 99% the food growing process, watching that little plant grow oh-so-slowly yet still requiring water, light and associated TLC. Step Two: START SMALL AND CHEAP. One of the frustrating things about getting started with growing food is dealing with the initial expenses and preparation. Gardening books generally come with an equipment list as long as the Nile, the total cost of which would bankrupt Rupert Murdoch. Not only can this expense be both daunting and a strain on one’s finances, but it can also make the beginner think twice about starting up; after all, why buy all that equipment if you’re not even sure you’re going to keep this up for more than a few days? There is also the annoying inconvenience that gardening in most cases tends to require a garden, something that not everyone in the UK is blessed with. 1) Don’t use the garden (yet). There’s plenty of things you can grow indoors in little pots to begin with. These will serve as a good test both of your resolve and skills, as well as give you a leisurely start to this hobby without already having to stress about things like weeds or the weather. 2) Don’t buy gardening books. Just tell your friends and relatives you are going to try to grow food and they will probably get you all the books you need for Christmas or your birthday (probably grateful of the fact they know what to get you). In fact, be prepared for at least one of your relatives to keep giving you gardening books for the rest of your life (there’s always one); if you are lucky they might even get you some gardening equipment, which would be a bonus. In the meantime, for information use the internet, support your local library or visit your local community garden. Gardening shops are ideal for experienced gardeners who know what they are after, and huge gardening centers do offer a great selection of equipment, plants, seeds, etc., but their prices can be deceptively expensive. As for the small, supposedly specialized gardening shops you sometimes come across in random places (or very middle-class shopping districts), they are often the worst offenders when it comes to ripping people off; I know it’s good to support independent businesses, but some of them do just take the piss. So, without having been paid to say this, go to a shop like Wilkinson’s where you will generally find the gardening basics you need at cheap prices. You can make all your early mistakes with that stuff before deciding to upgrade. There are of course benefits to buying the right equipment, first of all it does test your resolve a little bit, but without driving you out onto the streets; secondly tools and equipment do require some level of quality. This doesn’t mean you should buy a ridiculously over-priced and over-engineered spade that was designed by NASA scientists (I only exaggerate slightly), but neither should you buy a £1.99 excuse for a spade made of a metal so bendy it makes cream cheese look like solid steel. There is a balance to be struck. I bet your bin is full of small plastic containers that came with the food you bought (instant noodle pots, yoghurt pots, ready salad boxes, etc. ), so why buy a set of plant pots when you can reuse those? Poke a few holes at a bottom of an empty Pot Noodle and behold! You now have a plant pot. 5) Save your principles for later. Controversial one. You will make mistakes at the beginning (such as over-watering or under-watering), that’s a given, so would you rather make mistakes with a cheap packet of seeds and soil and a recycled Pot Noodle (total cost £2), or with an expensive packet of organic-super-plus-luxury seeds and mightier-than-though fair-trade soil and a terracotta pot made by your local artisan (total cost £20+)? IDEALLY, we want to work our way toward growing food organically, but that doesn’t mean we can’t do so gradually. Just do make sure the soil you buy is suitable for food growing (check on the packet). Step three: GET AN EDIBLE PLANT. Before trying to grow a plant from seed, it helps to check if you can keep an existing one alive. Buy one or two herb plants, something simple, sturdy and pest free like rosemary or sage. DO NOT, DO NOT, DO NOT buy it from a supermarket, no matter how cheap it is, as most supermarket herb plants are artificially boosted and designed to die soon after you get it home (shame on them). This is a case where you can afford to visit a garden centre, you should find decent herb plants there for about £3, give or take. Find a good spot for it at home, depending on the plant, either indoors or outdoors. Ask at the shop for advice, or check the net. Keep the plant alive and healthy, use its leaves for your dishes or to make herbal tea, learning not to overuse it. If aphids attack then learn how to deal with them. That’ll do for now. Enjoy the plant and learn from it. If it dies, it dies; you’ll learn from that too. Next we’ll look at actually planting things.